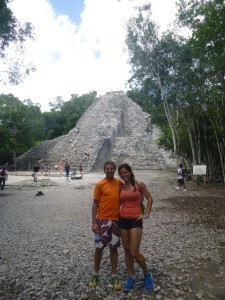 Jesse and I ready to climb Nohoch Mul. The tallest Mayan temple in the Yucatan Peninsula. 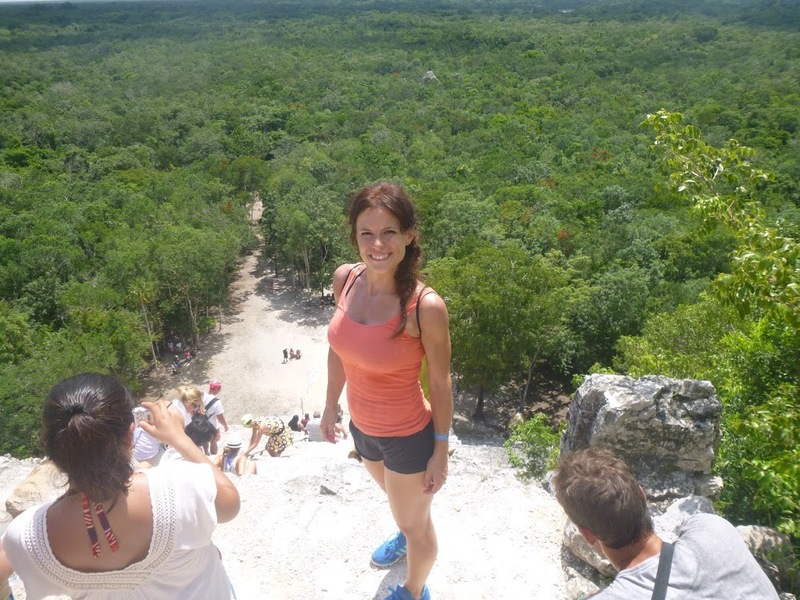 I already wrote about the first half of our Coba Mayan Adventure tour with Alltournative Tours: Coba Maya Encounter Adventure. 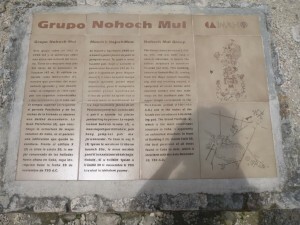 You can read my review here: Our Mayan Adventure and see pictures of our amazing experience rappelling, riding ziplines, hiking through the jungle, kayaking, interacting with the Mayan people, and swimming in the beautiful underground cenotes. 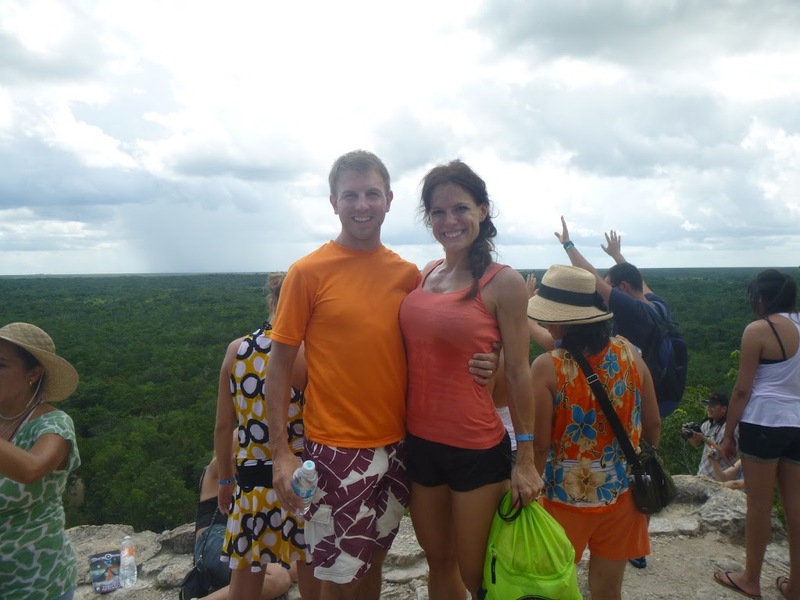 The second part of our tour included a trip to Coba, where we were able to explore many ruins, and climb Nohoch Mul. 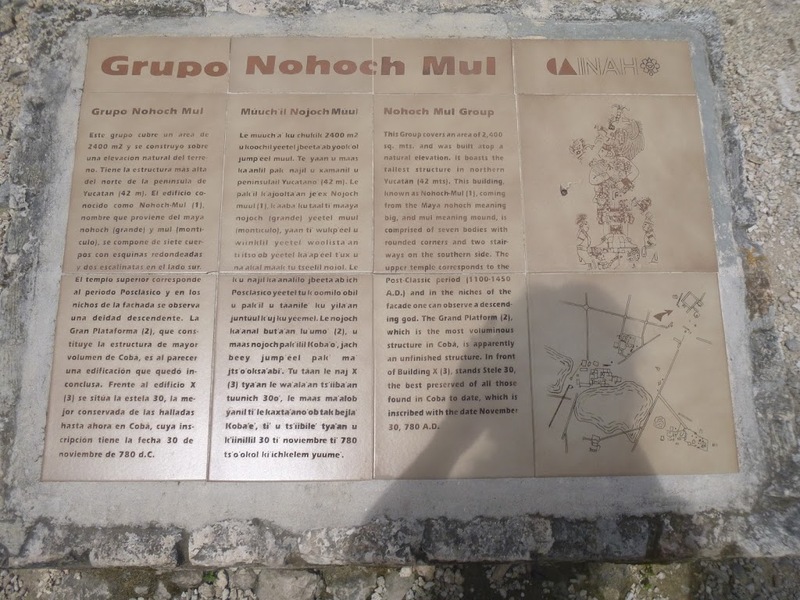 Nohoch Mul is the highest pyramid in the Yucatan Peninsula. There are 124 steps to get to the top, and the ascent is very steep. There is a thick rope going up the middle of the pyramid to assist climbers in getting to the top. Our tour with Alltournative included a 45 minute tour at Coba, after which you had time to explore the ruins. I was anxious to explore the ruins and climb Nohoch Mul so we skipped the tour and began exploring. You have three options for getting around Coba, which is covers a large area. You can walk around and explore the ruins, rent a bicycle for 35 pesos (about $3 in American money) or take a “Mexican Limousine,” which is a bicycle with a cart in front of it where you will be carried around the site. 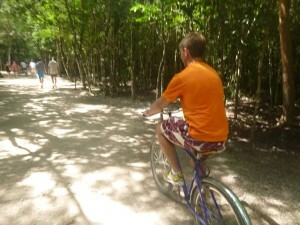 Jesse and I opted for the bike ride, because we thought it would be fun to ride through the jungle. The paths are made of white limestone, and it was a beautiful ride. The limestone limits the growth of the trees, so the height of the jungle has remained the same for many years. Jesse and I were able to walk straight to the top of Nohoch Mul without taking any rest breaks, and there were people of all ages climbing the pyramid. At the top there was even a group of people meditating at the Temple of the Descending God. Jesse at the top. You can see how steep the climb is. 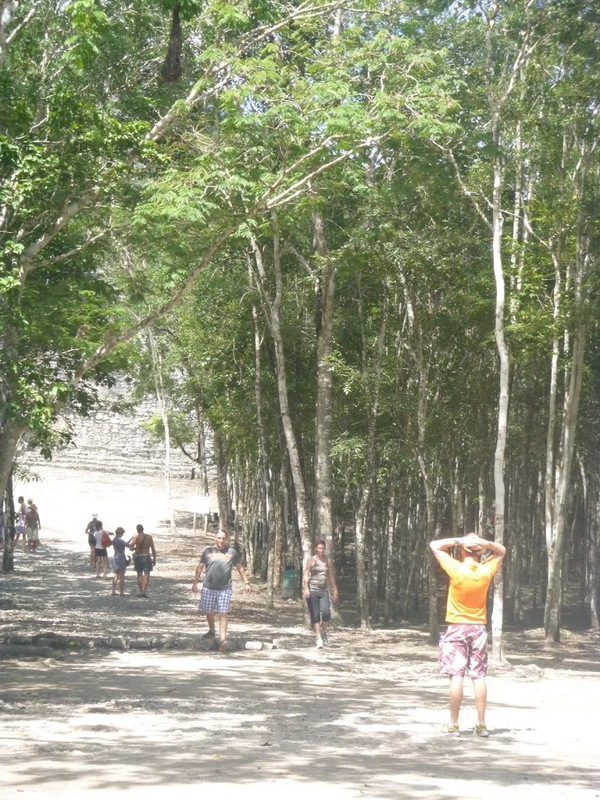 At the top of the pyramid you get to see a view quite similar to what the ancient Mayan priests would have seen. Our tour guide called the view the Green Sea, because as you look out the gorgeous green of the jungle below stretches out in all directions. At the top of Nohoch Mul. At the top of the pyramid is the Temple of the Descending God. There were several people sitting around the temple meditating. 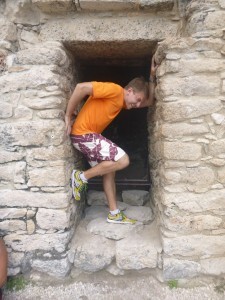 Jesse in the doorway of the Temple of the Descending God at the top of Nohoch Mul. 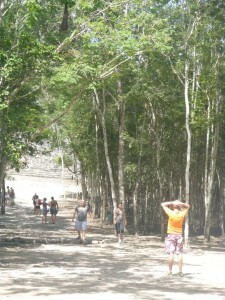 The “Green Sea” stretched out in all directions as you gaze outward from the top of Nohoch Mul. Due to the limestone limiting the height of the trees the view is likely very similar to what the ancient Mayan priests saw over 1500 years ago. 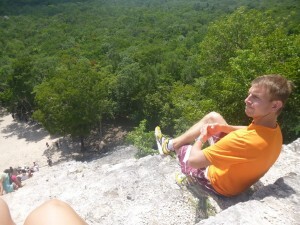 At the top of Nohoch Mul you can see why the view is called the Green Sea. Descending was more difficult than going up. We spent a long time at the top enjoying the experience and the view, and the site became more crowded. Many people took rest breaks on the way up and down, sitting on the steps. Some people came with their families, and it was wonderful to see three generations experiencing this climb together. 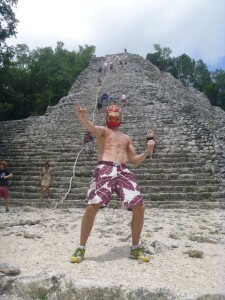 As we descended the pyramid of Nohoch Mul Jesse felt adventurous. 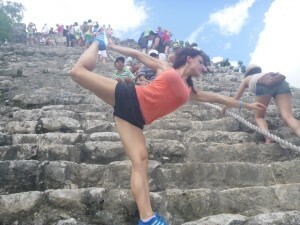 I wanted to do yoga at the top of Nohoch Mul, but it became crowded. I went into Dancer’s Pose as we descended. You can see how steep and high the steps were. It was a lovely climb to the top. Keep an eye out for the natural wonders around you. We spotted several lizards, and this tarantula. 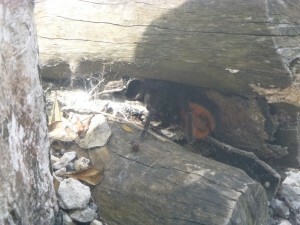 The spider was about the size of my entire hand. 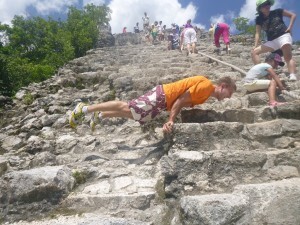 Jesse taking in Nohoch Mul from the base. After climbing down Jesse and I took some time to process the experience, and marvel at the opportunity we had to visit a structure that has stood for so long. The sites at Coba are still being excavated and the majority of the structures remain untouched. 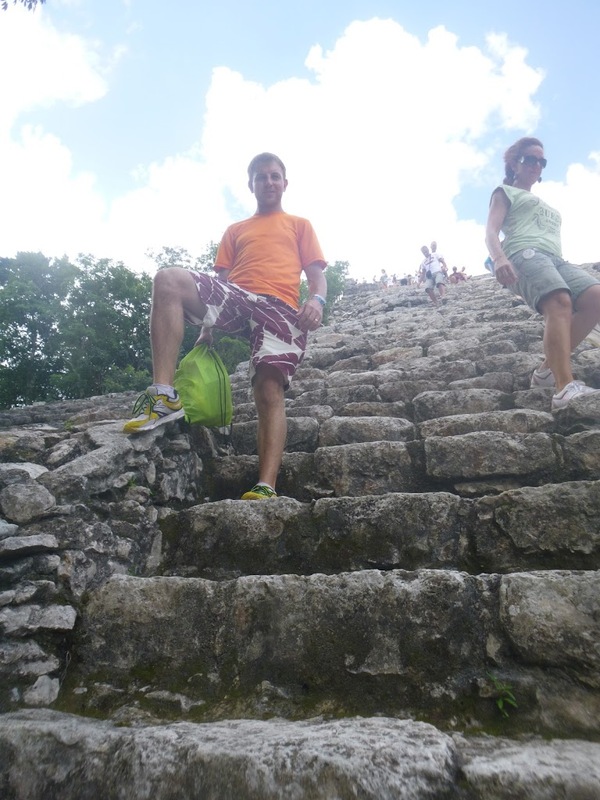 Modern archaeologists are still discovering much about the Mayan culture that existed at Coba. 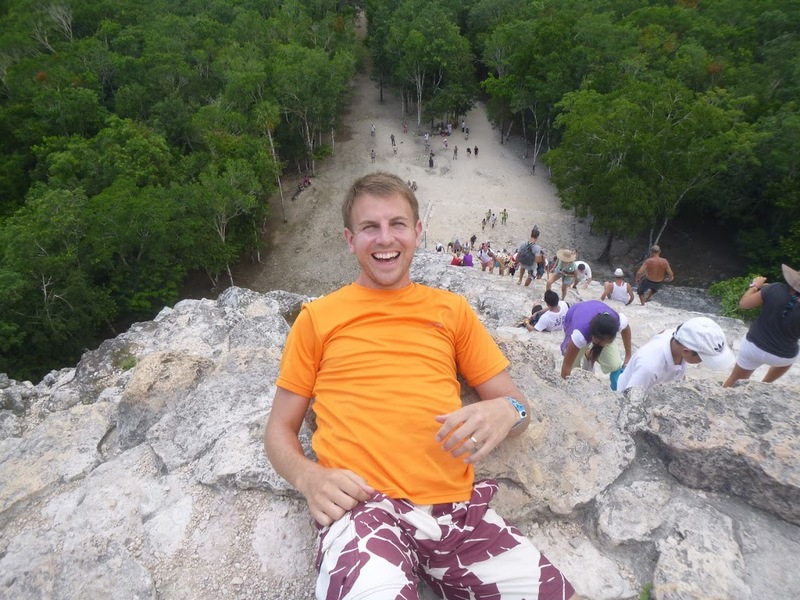 If you have a chance to visit and climb Nohoch Mul, I encourage you to seize the moment. It was a beautiful trip, and a wonderful experience. Jesse and I loved remaining active on our trip and learning some of the history of the Mayan people. 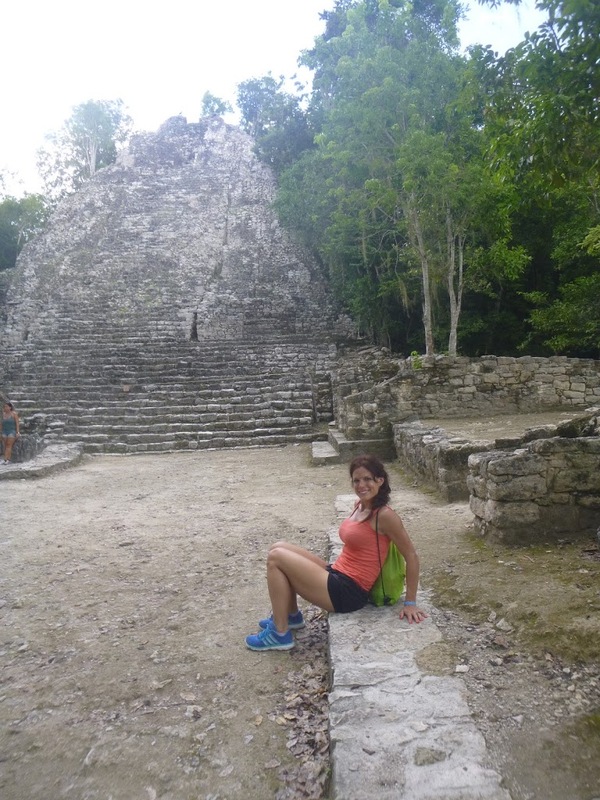 Visiting the Mayan ruins was on my Bucket List. I still have more to visit, and I would like to visit Coba again and spend some more time there. Exploring some of the other ruins at Coba.